When Brigadier General Robert Charles Tyler fell near the palisade entrance to the fort bearing his name, he would go down in history as the last Confederate General to die in combat during the American Civil War. Tyler was also one of the most mysterious. After the battle, Colonel James Fannin of the Georgia Reserves cut the stars and wreath off the general’s collar intending to send them to his family. Thirty years later, Fannin was still looking for them. Little is known of Tyler’s youth, only that he claimed to have been born and lived in Baltimore, MD. Tyler probably left Baltimore at an early age to make his fortune in the Gold Rush in California. There, like many others in the gold camps, fortune eluded him. The first definite proof of anything about him comes in 1855 as part of William Walker’s Filibuster Army in Nicaragua. Tyler became a lieutenant in Walker’s forces and participated in several of Walker’s battles with invading Guatemalan and Costa Rican armies, including his last, the battle of Rivas. Surrounded and hopelessly outnumbered, Walker surrendered in May of 1857, and his men were deported back to the United States. Tyler, arriving in New York City on June 28th, 1857, made his way back to Baltimore to work in the much less exciting occupation of a clerk. By 1860, the call of adventure had once proven too strong for Tyler, and he was in Texas as part of the clandestine, Knights of the Golden Circle. The Knights followed a similar ideology as Walker’s: they dreamt of a tropical slave-friendly empire ringing the Gulf of Mexico, and they were marshaling their forces in Texas to invade Mexico. Tyler was given the rank of colonel and made quartermaster of the organization. However, they never invaded, and Tyler found himself in Memphis, Tennessee, when war clouds gathered in the Secession Crisis. Tyler enlisted as a private in the 15th Tennessee Infantry, but quickly rose to the rank of captain and quartermaster; in less than a year, he was commanding the regiment as lieutenant colonel. In this position, he led his regiment through the battle of Shiloh, winning high acclaim, having three horses shot from under him, and being severely wounded. Returning for duty, he was elected as full colonel of his regiment and soon saw action at Perryville, Kentucky, and again gained notice—this time of the Army’s commander, Braxton Bragg. Bragg detailed Tyler to gather quartermaster stores for the army in Kentucky and move them south to Knoxville; upon completion of that duty, Bragg made Tyler the Provost Marshall for the Army of Tennessee. 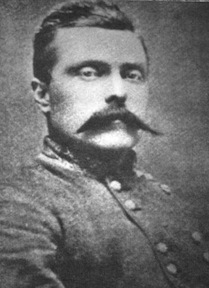 Tyler and the 15th returned to regular duty in the late spring of 1863, with his regiment being consolidated with the 37th Tennessee Infantry and with Tyler in overall command. Tyler and his men found themselves in a handpicked brigade formed by Bragg and commanded by General William Bate. The new command was soon bloodied in the fighting near Hoover’s Gap in the Tullahoma Campaign. At the battle of Chickamauga that September, Tyler proved himself again, being noted for “courage and daring” and singlehandedly dragging a captured cannon back into Confederate lines during the fighting on September 19th. As the fighting began on the final day, September 20th, Tyler was wounded again. He returned to his command in time for the final fight for control of Chattanooga at Missionary Ridge on November 25th, luck was not with him that day, and as disaster spread along the ridge, Tyler was seriously wounded in his leg—a wound that forced surgeons to amputate. Tyler’s recovery from this would be long, and though his old mentor, Bragg, helped him obtain promotion to brigadier general, he never returned to service in the Army of Tennessee. Instead, he found his way to the military hospital at West Point, and then to command of the post there, where fate placed him on the morning of April 16. Hoping to prove himself once more—though the odds were stacked against him—the general hobbled about on crutches for his first and what proved to be his only battle as a general. Nearby soldiers rushed to him and carried his body back to the base of the garrison’s flag pole, and there he lay until the flag came down. After the battle, his body was taken and buried nearby: the last Confederate general to die in combat during the war. This entry was posted in Battles, Leadership--Confederate and tagged Army of Tennessee, Braxton Bragg, Charles Tyler, Chickamauga, Filibuster Army, Fort Tyler, Knights of the Golden Circle, Missionary Ridge, Perryville, Tullahoma. Bookmark the permalink. I don’t understand, there was a Confederate West Point?